After leaving a trail of familiar bodies in Riverdale, Jughead Jones has run out of town and joined the circus. Learning that he comes from a long line of werewolves and unknowingly malling people to death while transformed into a monster, Jughead hopes to tame his bloodthirst. He cleans the cages of animals that he swears sense his primal alter ego and chains himself at night to keep him from wreaking havoc on people. This is quite the turn for a historically funny slacker who loves eating burgers. Meanwhile, Betty Cooper has her own family lineage of werewolf hunters. She and Archie Andrews are hot on Jughead's trail scouring burger joints looking for clues. This isn't the Betty you're used to seeing. No longer the third prong of the famous love triangle between Archie and Veronica, Betty is a relentless hunter determined to find her prey. Archie is just trying to keep up as Betty tries to toughen him up. They make an odd couple but it mostly works if they can learn to work together. Tieri creates some chills and thrills but also a lot of empathy for Jughead. He's really at a loss fighting his urges, afraid of killing more people, trying to contain the beast within himself. He's already cost so many lives even leaving Reggie Mantle close to death. Jughead is the David Banner of 'The Incredible Hulk' television series, on the run with a secret monster lurking inside. But instead of a heroic green beast, a ravenous killing machine emerges striking at anyone near him. You can't help but feel sorry for him. The team of Pat & Tim Kennedy and Matt Herms create a fast-paced, highly dynamic layout of eerie and shadowy panels. Even the exposition seems to race by with some cleverly designed pages. Herms sticks to a limited color palette of oranges, yellows, and greens. It sets the mood throughout, never revealing too much lulling the reader into comfort before exposing the shocking twist or two. 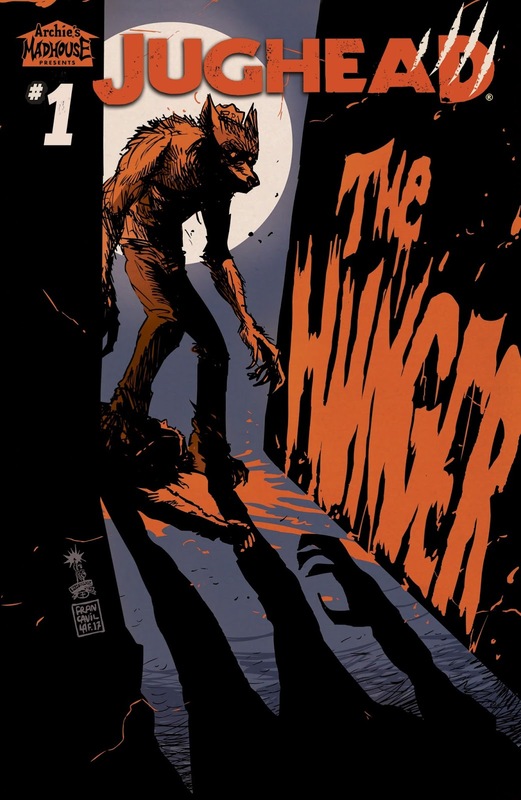 'Jughead: The Hunger' is off to a great start with a ton of potential as both a horror story and a monster chase. Tieri leaves just enough mystery to draw you back in and the excellent art provides the perfect atmosphere for mayhem. This is another worthy addition to the alternate Archie world of horror joining Afterlife with Archie and the Chilling Adventures of Sabrina.